While I admire and enjoy the revamped King’s Cross Station, I always felt they were missing a trick by filling it with chains. It’s the first impression a lot of people will have of London – a city filled with chains is not the best impression. So, I was pleasantly surprised to find, out in front of the new station, a little stall called Coffee Dogs which, while looking like a fast food chain, is in fact an independent eatery/cafe. Well, I say independent – it is owned by the people behind the Fine Burger Co, which has branches in St Pancras and the ExCel centre. 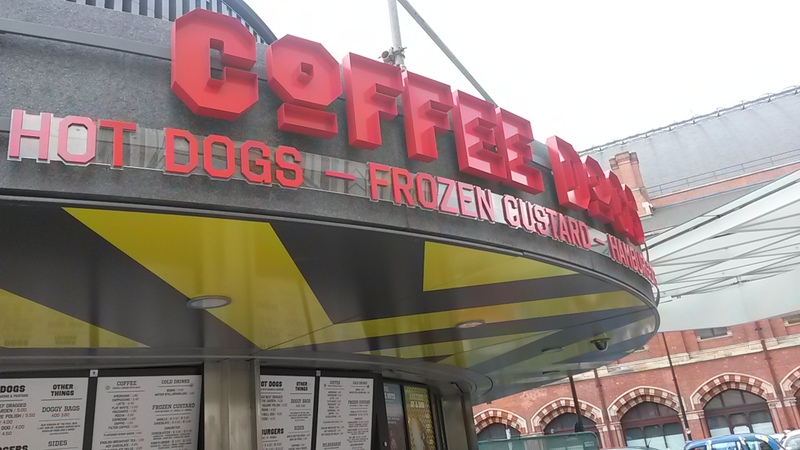 Coffee Dogs serves the Mutt Nutts – that’s not a review, it’s the name of the coffee. Sourced from Rainforest Alliance farms, the coffee was good – a strong acid kick with deep chocolate notes. 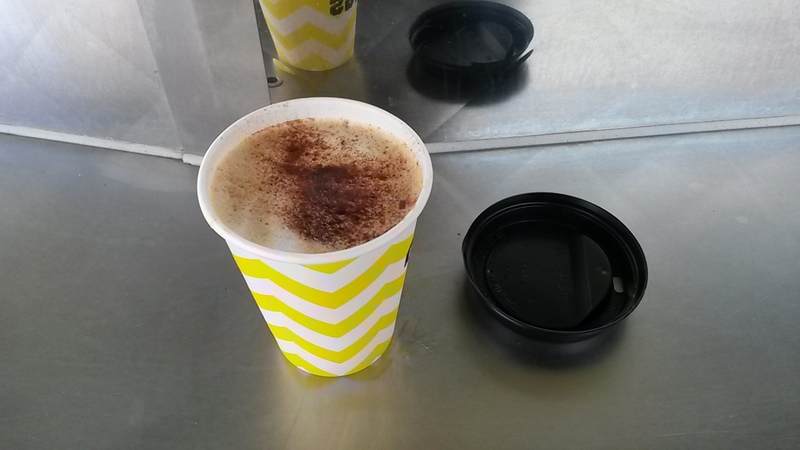 It was a bit hot and very large, and it loses a point for being served in a takeaway cup. There’s something about that cardboard rim that ruins a perfectly good coffee. Still, for a takeaway it was pretty good and at only £2.40 a good deal for your train journey. 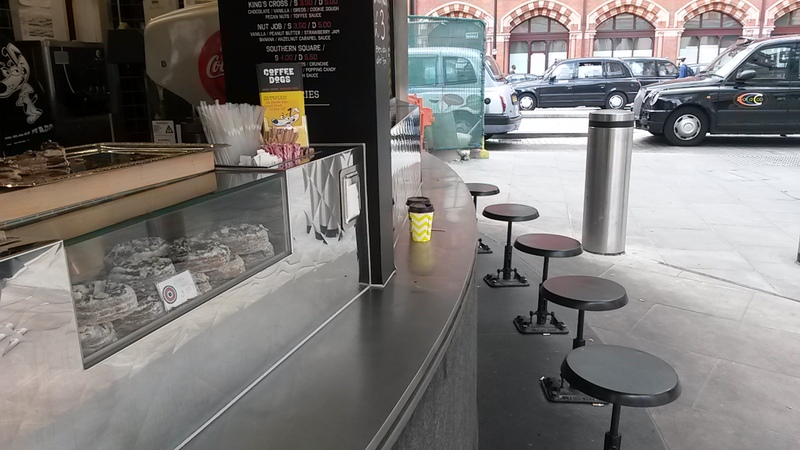 While this is clearly aimed at the takeaway market, it does have a number of stools around the edges so you can sit and relax before jumping onto your train. It’s a great spot for people watching but the stools were a little uncomfortable and if the weather is anything but glorious you’re going to be cold as the seats aren’t sheltered. They are covered so it’s a good spot to rush to during the rain. Coffee Dog, as it’s name suggests, serves hot dogs alongside the coffee. Oh, it also serves frozen custard (no, I don’t really know what it is either). And burgers (£4 for a basic, £7 for a double patty with bacon and cheese). 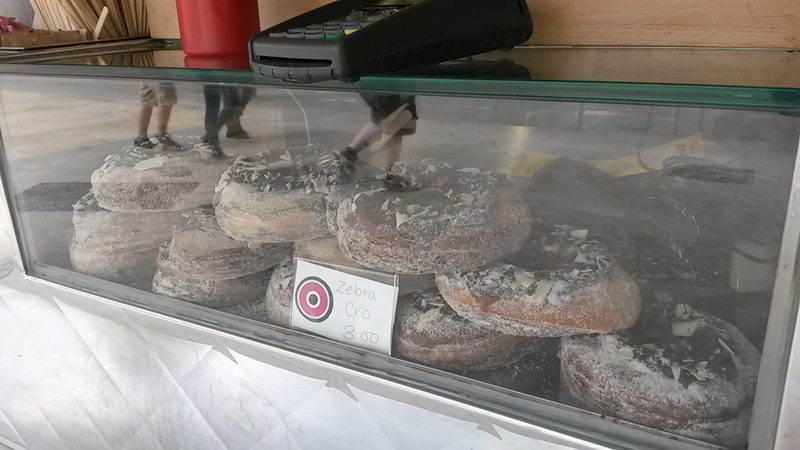 And Cronuts, a mix between a donut and croissant. So a bit of everything and something a bit different. The hot dogs come with a variety of toppings and fries are £2.50. Beats another Pret sandwich. It’s fast food service but done with a smile. It was quick but without much chat. It’s a take away place so the extras were always going to be missing. It does do catering if you want a load of hot dogs and frozen custard at your birthday. It adds a little something different to the standard choices available at King’s Cross and serves an pretty good coffee for a takeaway joint.